It was a busy week for the winos, so last weekend we celebrated Tempranillo Day (a few days late, ironic since Tempranillo translates to early) with a delicious paella party and several different Tempranillo wines to taste. Tempranillo Day celebrations originated with the Tempranillo Advocates Producers and Amigos Society (TAPAS) in 2011 and this year was celebrated on November 14. They have great information on their website ( http://www.tapasociety.org/) about this grape grown in Spain as well as Argentina, Chile, and many more countries. For 2014, the TAPAS Grand Wine Tasting is scheduled for Sunday, April 27, 2014 at the Presidio in San Francisco. Save the Date! Next, the paella. There are different types – Valenciana, Seafood and Vegetarian. 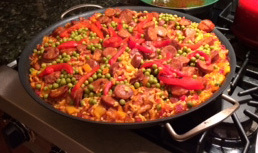 To accommodate some allergies to shellfish, our hostess prepared a delicious chicken and sausage paella. this was perfect for Tempranillo. With seafood paella we may have been inclined to try white wines. Just so you know, Juan Galbis from Valencia is listed in Guinness World Records for te world’s largest paella in 1992, but he claims to have made an even bigger one in October 2001 that fed about 110,000 people. 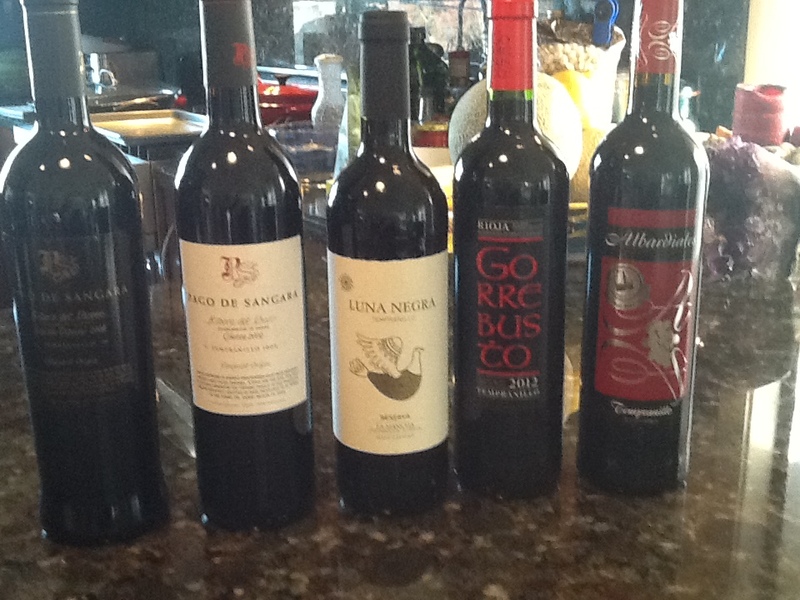 Finally the wines, everyone brought something different, all from Spain, ranging from $40 to $7. Albardiales, La Mancha 2012 – Too light, I don’t think hyperdecanting would even help this one. The paella overpowered it. Gorrebusto, Rioja 2012 – we didn’t open this one, that’s the truth. Looking forward to Tempranillo Day 2014! Categories: Blind Test, Events, Wine | Permalink.